Nuts of various kinds contain beneficial omega-3 fatty acids, vitamin E, vitamin B-6, trace minerals, fiber and protein. Eaten in moderate amounts, nuts may help protect against heart disease. But the healthy oils contained in nuts can go rancid over time, with both short-term and long-term health consequences. Nuts contain unsaturated fats that oxidize when exposed to heat, light and air, breaking the double bonds in the fat molecules. The short-chain fatty acids left behind are what make nuts rancid. The types of nuts with more of these fats, such as walnuts, pine nuts and pecans, are at a greater risk for rancidity. You can tell a nut is rancid if it has a grassy or paint-like odor, or if it has a yellow, dark or oily appearance. However, the best way to tell is if the nut tastes "off." If you eat rancid nuts, chances are you won't suffer any side effects, other than the unpleasant taste in your mouth. But in some cases, rancid nuts can cause irritation to the lining of your stomach and intestines, and you may experience nausea, vomiting or diarrhea. The long-term effects are more troubling because the rancid oils in nuts develop potentially toxic compounds that promote inflammation and are carcinogenic. In rare cases, eating rancid or contaminated nuts may cause worse symptoms right away. Seek medical attention if you have severe vomiting or diarrhea that contains blood, extreme pain or abdominal cramping, a fever above 101.5 F, problems speaking or swallowing, double vision, or muscle weakness that moves from the top of your body to the bottom. If you are dehydrated, be sure to replenish your fluids with water or sports drinks. Roasted, chopped and ground nuts go rancid much more quickly than whole raw ones, both shelled and unshelled. Buy small amounts of nuts instead of large economy-size bags to reduce the risk of having nuts around long enough to go bad. Store nuts in an air-tight glass or plastic container in a cool, dry spot around 35 degrees F, away from light. A refrigerator is an ideal location. Shelled nuts will keep for six months in the refrigerator and up to a year in the freezer. Unshelled nuts may keep up to two years. 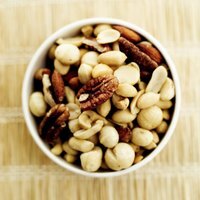 DrWeil.com: Are Nuts a Healthy Nibble?